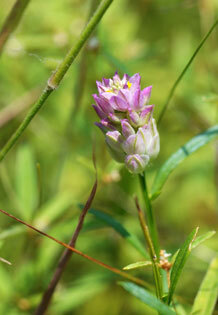 Also Called: Purple milkwort, purple polygala, blood polygala. Stems: Erect, usually single, simple or branching above, somewhat angled, glabrous. Leaves: Alternate, numerous, erect or ascending, linear to elliptic-linear, .2 to 1.6 inches long, less than .2 inch wide; margins finely-toothed; tips abruptly short pointed. Inflorescences: Raceme, head-like to short cylindric, blunt and dense, 1/5 to 1/2 inch in diameter, 1/4 to 1.4 inch long; terminal on stalks 1/6 to 1 inch long. Flowers: Pinkish, purplish, greenish or white; sepals 5, 2 lateral wings ovate-oval, less than 1/4 inch long, 1/10 to 1/8 inch wide, tips rounded; petals 3, united into a tube shorter than sepals, lowest petal or keel about 1/10 inch long, crested; stamens 8. Fruits: Capsules, nearly circular, 2-seeded; seeds tiny, spherical, short-hairy. Habitat: Sandy prairies, open woods and moist meadows.